I was diagnosed with hypothyroidism, an underactive thyroid, the year following the birth of my first son in 2006. I struggled day to day with a fatigue that hit me like an avalanche of bricks. I trusted my doctors and followed their thyroid drug protocol to the letter never once thinking they might not know everything there was to know about hypothyroidism. I trusted them as the experts especially when I became pregnant that second time. 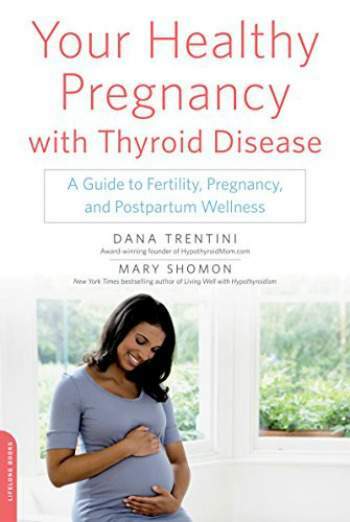 I would later learn that my Ivy League medical school trained and top awarded doctors in New York City did not know enough about hypothyroidism, especially the dangers of hypothyroidism and pregnancy. Under their care my TSH (thyroid stimulating hormone), the gold standard for measuring thyroid function in mainstream medicine, reached levels far above the pregnancy recommended reference range and endangered my baby’s life. In the Journal of Medical Screening, researchers in a large study of 9,400 pregnant women demonstrated that pregnant women with hypothyroidism had a second trimester miscarriage risk four times the risk of women who were not hypothyroid. If hypothyroidism has been diagnosed before pregnancy, thyroid hormone replacement medication dosage should be adjusted to reach a TSH level not higher than 2.5 mIU/L prior to pregnancy. Throughout my first trimester, my TSH remained higher than the above recommended 2.5 mIU/L, soaring close to 10.0 mIU/L. Despite my raging hypothyroidism symptoms, my doctor said that everything was fine and that TSH was only a concern in pregnancy above 10.0 mIU/L. My doctor clearly never read the 2007 Endocrine Society clinical guidelines for pregnancy. My doctor tried to assure me there was no link between hypothyroidism and miscarriage, but my instincts told me they were wrong. I failed to listen to my instincts and I paid a heavy price. As the medical staff prepared me for my D&C that fateful day, I vowed that I would do everything in my power to research everything there was to know about hypothyroidism and tell women everywhere. You may wonder why I created Hypothyroid Mom. Here I am a woman with zero blogging experience. I never used Twitter or Facebook ever before the start of Hypothyroid Mom. What in the world am I doing creating a blog? That babies are being needlessly harmed from medical lack of awareness about thyroid disease is unacceptable. I failed to protect my child and I have to live with that regret for the rest of my life. I can’t go back in time and change things no matter how much I wish it. in memory of my child. 1. Endocrine Society (2012, June 23). Mild thyroid dysfunction in early pregnancy linked to serious complications. Newswise. Retrieved July 3, 2012 from http://www.newswise.com/articles/mild-thyroid-dysfunction-in-early-pregnancy-linked-to-serious-complications. 2. Allan, W.C., J.E. Haddow, G.E. Palomaki, J.R. Williams, M.L. Mitchell, R.J. Hermos, J.D. Faix, R.Z. Klein. Maternal thyroid deficiency and pregnancy complications: implications for population screening. J Med Screen 2000; 7:127-130. 3. Rao VR, Lakshmi A, Sadhnani MD. Prevalence of hypothyroidism in recurrent pregnancy loss in first trimester. Indian J Med Sci 2008;62:357-61. 4. The Endocrine Society. Management of Thyroid Dysfunction During Pregnancy and Postpartum: An Endocrine Society Clinical Practice Guideline. Journal of Clinical Endocrinology & Metabolism 2007; 92(8)(Supplement):S1-S47. Thank you for this article! I was pregnant for the first time and unfortunately miscarried in October. My doctor was monitoring my tsh levels before and cleared us to start tying. My tsh when we first found out I was pregnant was 1.5 so my doctor kept my dosage the same and when I got tested a month later, it went up to a 5. My doctor informed me via an emailing stating “you’re not optimal for pregnancy” even though she knew I was already 9 weeks at that point. I miscarried 4 days later. My doctor assured me that my tsh had nothing to do with my m/c and that my levels increased so drastically because my fetus “wasn’t healthy”. You get to the point where you don’t know who to believe. I will be doing a ton of research before my next pregnancy. This truly helped, thank you! I have had 2 miscarriages….one after my son was born in 2000 at 8 weeks and the other after I had my daughter in 2007, also at 8 weeks. I had no idea at the time why this happened. I knew I had an undiagnosed autoimmune issue going on, but never had a diagnosis. After my 2nd miscarriage, I was advised that if I wanted to try again, it was recommended that I have genetic counseling. I decided that after my 2nd miscarriage that I didn’t think I could handle another failed pregnancy and that I should feel blessed that I have 2 healthy children. Fast forward a few years when I was struggling with extreme fatigue and other hypothyroid symptoms that I was put on synthyroid even though my TSH levels were normal. Even though I was taking medication, I still felt terrible and decided I needed to see an endocrinologist who immediately sent me to have an ultrasound and more blood work done. I was diagnosed with Hashimoto’s and ended up having to have a total thyroidectomy. After my surgery and the pathology came back, the report said they found cancer in it…follicular variant! I was very lucky that I ended up having it removed. I had no idea at the time that my thyroid issues could have and probably resulted in the loss of my 2 babies. Thank you for this article. I always tell people who ask me about my thyroid issues that if they aren’t getting the answers they seek from their doctor, to find another one that will listen. Hi Cyndi, I”m sorry to hear all you’ve been through and an important story really of how your thyroid cancer was discovered. When something doesn’t feel right, it isn’t right. I have many Hypothyroid Mom readers here that read the comments and yours will remind them to get another medial opinion. I had a miscarriage on August 1st at 6 weeks. My re did not want to test my tsh because she had just changed my dose a few weeks before I found out I was pregnant. So we waited two weeks and by the time they tested my tsh it was 18. Less then a week later I miscarried. I kept telling them I knew they were high because I was feeling awful. Next time I will trust my gut and just go to my family Dr right away if my ob or re won’t test them. Thank you so much for sharing this with us women who are looking to conceive. Though a thyroid issue isn’t present now doesn’t mean that during pregnancy it can not show up so I LOVE your blog. 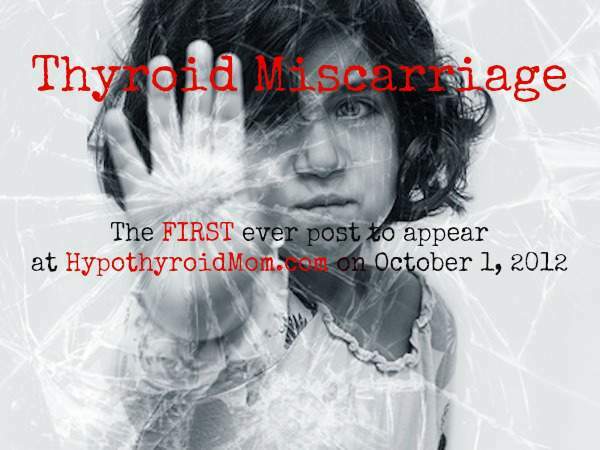 I am one who suffered 2 missed miscarriages due to my thyroid. I had no idea I even had a thyroid problem till I had testing done at 7 weeks pregnant during my second pregnancy, I didn’t began treatment till my 8th week but it was already too late. It traumatized me so bad that currently I am expecting and I am still nervous and shook from my experience. Nonetheless I believe it’s very important to seek treatment right away. Thank you so much for sharing. I am just coming across this article in a search fueled by PURE RAGE. I have had two losses this year, both at 8 weeks, both with a slow heart rate and underdeveloped fetus. My next step was to find a Reproductive Endo and as a Type 1 diabetic with Hashimoto’s who sees an endocrinologist every 3 months with blood testing at least yearly, my assumption was that I would have known if there was an issue that could cause me harm or to lose a baby. Just for my reference, I decided to call my diabetes endo today and ask for the last TSH level so I could be prepared when making an appointment with an RE. To my SHOCK, they have not run TSH tests during any of my bloodwork since 2015!!!! THREE YEARS!!! and at that time, my level was 3.84, which would have been a contributing factor to a miscarriage three years ago! I can’t even imagine what my levels are now in 2018 and I’m simply enraged. Thank you for this article and for sharing your story. I am praying to find answers in the coming weeks. Oh wow. I am so sorry to hear about your losses. They really should have been testing your TSH especially after the second loss. I hope things get figured out and taken care of. Also, with ALL 4 of my pregnancies/miscarriages , I have had slow rising HCG. My step sister and other family member took hcg injections and they no longer miscarried. I asked my Reproductive endo about this and she said hcg is a reflection of the health of the baby and taking Injections wouldnt make an unhealthy embreyo healthy again..
Any knowledge in this ? I have had 4 back to back miscarriages with unexplained causes. All super early. 7.5,6.5,4.5, 4 weeks . I had monitored my tsh and t4 . Prior to my 2nd miscarriage my primary put me on T3 bc it was low but 2 weeks after that my thyroid endocrinologist took me off of liothironine bc she said in pregnancy you only go off of tsh bc the baby only uses t4 or sees t4, if I took t3 it could give a False view of your overall tsh: I sometimes still wonder about this. If I have low t3, could this be causing my miscarriages ? I have just suffered a miscarriage as well and I was diagnosed with postpartum thyroiditis after the birth of my son 2 years ago and I can’t help but wonder if my hypothyroid had anything to do with my miscarriage. My TSH levels were well below 2.5 so I don’t really know. I am grateful for your honesty and desire to help other women! I miscarried right before Thanksgiving and it absolutely broke my heart. I have two beautiful healthy children but I decided to get my thyroid checked and recently they found a nodule. I will have a biopsy Friday. I can’t help but think there was something I could’ve done. Im glad I googled this because I’m trying to lose weight and it’s not happening! Like at all! Thank you for writing this book!